Our professional wood and pellet stove repair technicians are available to service, fix or provide wood stove installations. We will schedule an appointment to come to your home and diagnose any problems that your stove may be having. There is a service call fee of only $169.99 which includes up to 1 hour of time. This price covers the cost for us to arrive at your home, get a good, clear understanding of exactly what isn’t working properly, getting set up and any work we will perform up to the first hour. After the first hour of service, there is an additional charge of $80 per 1/2 hour for labor, billed in 15-minute increments, which includes the cost of any parts needed. Please keep in mind, pellet & wood stove repairs can sometimes require a return trip. A return trip charge may apply. We have extensive resources and can almost always get your parts fast if they are currently not in stock. We currently specialize in kozi pellet stoves, pacific energy wood stoves and timberwolf wood stoves. With over 2o years of experience and manufacturer’s training, we provide a professional and thorough cleaning of pellet stoves and exhaust vent pipes. The cleaning of the stove generally includes the firebox, combustion blower, convection blower, ash traps and the glass. We also include an overall visual inspection to help ensure your stove is functioning efficiently and safely. Same services provided as the Standard Pellet Stove Service above. Due to being an insert it is more difficult and takes longer to clean a pellet insert. With over 2o years of experience and manufacturer’s training, we provide a professional very thorough cleaning of the wood stove and the exhaust vent pipe. The cleaning of the stove generally includes the firebox, ash traps, and the glass. We also include an overall visual inspection to help ensure your stove is functioning efficiently and safely. Same services provided as the Standard Wood Stove Service above. Due to it being an insert, this service is priced with the understanding that there is no need to remove the stove from the fireplace, there is usually a full stainless steel chimney liner also installed. Additional charges will apply if the cleaning requires any power tools to remove creosote, or we need to remove/install the inert. Other restrictions may apply. What better service could you ask for? We will install your new or used stove. 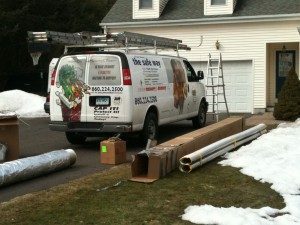 Whether you purchased it from us or not, our highly trained technicians will provide you with a safe, clean and professional install.